Size Globe: 4" Height x 4"Width x 1.8" opening with small vents for ciruclation. Size Teardrop: 7.7" Height x 3.5" Width x 1.8" opening with small vents for ciruclation. Able to stand or hang. Rural style, give you a different life of emotional appeal. Beautiful and attractive, Create a fashion life atmosphere, Make your life more poetic and relaxing. Also modern design to any place. Material: High boron silicon glass. 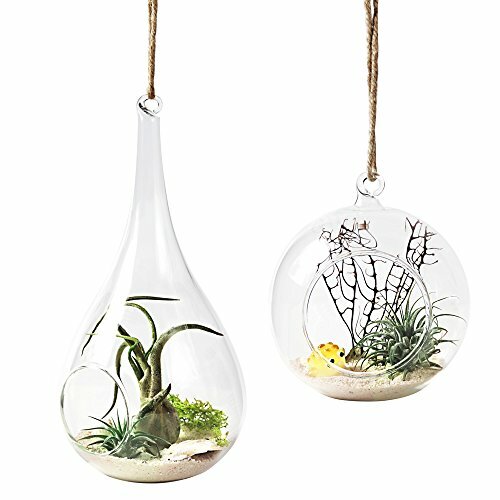 Perfect for succulent, air plant or other indoor plants. No plant included in this item! Able to stand or hang. Ideal size for small window, desk, small table. More perfect if matched with white rocks, pebbles or acrylic. Size: The Globe is 4 inches wide with a flat bottom and top loop for hanging and a large 1.8 inches opening with small vents for ciruclation. The Teardrop is 7.7 inches high and 3.5 inches wide. Mkono is a registered trademark and our product is professional manufacturing and sole selling.